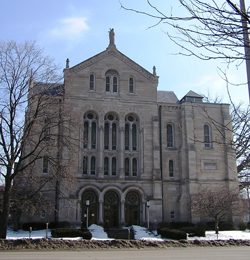 Roberts Park Methodist Episcopal Church is an important early example of Romanesque Revival architecture and one of the oldest churches remaining downtown. Its congregation has its roots in one of the first Methodist groups in the city that began meeting in Indianapolis in 1821. By the 1840s, two congregations had formed from this first group, and one of them built Roberts Chapel at Market and Pennsylvania Streets. The Roberts congregation decided to move out of the downtown, such as it was, just after the Civil War. The congregation bought the present site and began construction in 1869. Financial constraints meant that the church was not totally finished until 1876. D. A. Bohlen was the architect of the church. Bohlen came to Indianapolis with architect Francis Costigan in the 1850s. A German immigrant, Bohlen is often credited with being the first trained architect in town. Costigan, though skilled, had never studied architecture. Bohlen’s Romanesque-inspired church predates Henry Hobson Richardson’s essays on the style by years. At the time of Bohlen’s training in Germany, the Rundbogenstil, or Round-arched style, was popular. Its proponents blended classically influenced styles into a monumental new style that resembled buildings of the Romanesque period. Roberts Park Church reflects this style. The church is constructed of limestone from Emmitsville, Indiana, and is rectangular in plan with a bell tower. The corner tower was originally intended to have a tall spire, which was never executed. The interior of the church has well-crafted woodwork and a fine, large sanctuary with seating for 1200 people. A pair of elaborate black walnut staircases lead to galleries supported by cast iron posts, that wrap around three sides of the interior of the sanctuary. Roberts Park Methodist Episcopal Church (now Roberts Park UMC) is located at 401 North Delaware St. The church is open for Sunday services.